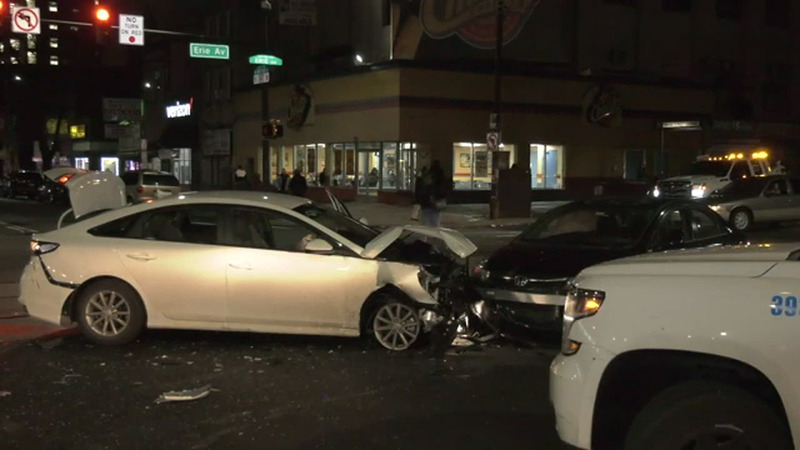 PHILADELPHIA (WPVI) -- Police say a woman allegedly behind the wheel of a stolen vehicle struck an officer in Philadelphia Saturday evening. The incident happened around 6:30 p.m. on the 3100 block of Reach Street in the city's Kensington section. Police responded to a report of cars being struck by another vehicle. When the officer got out of his vehicle to check, he was struck in the leg by the woman's stolen vehicle, police say. The officer was taken to the hospital for minor injuries. The woman was arrested a short time later at Broad and Erie in Tioga-Nicetown.